A Bangalore-based company, Ausum Tea makes organic tea blends and tisanes that are unique, and even fun! More so since these blends make the most amazing additions to cocktails! 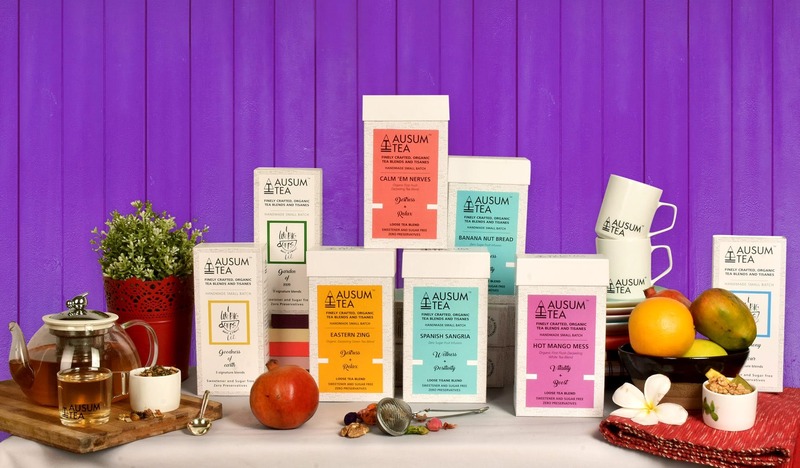 Ausum Tea was apparently to make blends and tisanes (flavoured infusions that don’t actually have tea), that are quirky, fun and will instantly stir up memories – like Winter In A Mug that’s practically Christmas all year. And what a fitting name, no? Ausum, as awesome as it is, means bold and darling – just like the teas. If you like your Assam and Darjeeling tea, and nothing else, then all I’ll say is, try it. You might just like it. Sure it may not replace your morning cuppa, but for a pleasant drink post work, or with friends to unwind after a solid meal, these are really flavourful and refreshing. Oh, plus they’re organic and ethically-sourced. And if you’re not sure about it, then they have samplers too. Try those first. To be honest, I am a coffee drinker. And married to a coffee planter, I don’t have much of a choice! So when I was introduced by a friend to Ausum Tea, I was sceptical. But when I sipped on a mug of Winter in A Mug and After 8, I was truly blown away. The former was packed with all things I associate with a Christmas in England with cinnamon, star anise and apple hitting all my senses! For all of you who like the smell of rain, there’s a divine tea called Petrichor – liquorice, clove, spearmint, ginger and much more, with first flush green tea. Yum! With a total of 9 blends at the moment, I can’t wait to try the Spanish Sangria. Get the Hot Mango Mess for your next party. It’s the perfect blend to add to a cocktail. A hint of spice, sweet and the quintessential mango sour, it’s even got a tinge of strawberry and calendula petals. You’ll be a hit at your house party by just adding some rum or even whiskey. I’ll drink to that! Craving Sangria, Chocolate Or Banana Nut Bread? This Tea Brand Has A Huge Varie-Tea Of Blends!